I seriously can not believe how much this little girl is already so spoiled. And she's not even here yet! Words cannot express how blessed Ryan & I feel that our friends and loved ones have showered us so much. I definitely know this is not typical and am so very grateful for everything! Thank you! Thank you! THANK YOU! We are definitely well prepared for Maggie's arrival!! Ryan & I are very lucky to work for such a great company and work with even greater people. Both of our work groups threw us the cutest showers. I had no idea they were going to do that! 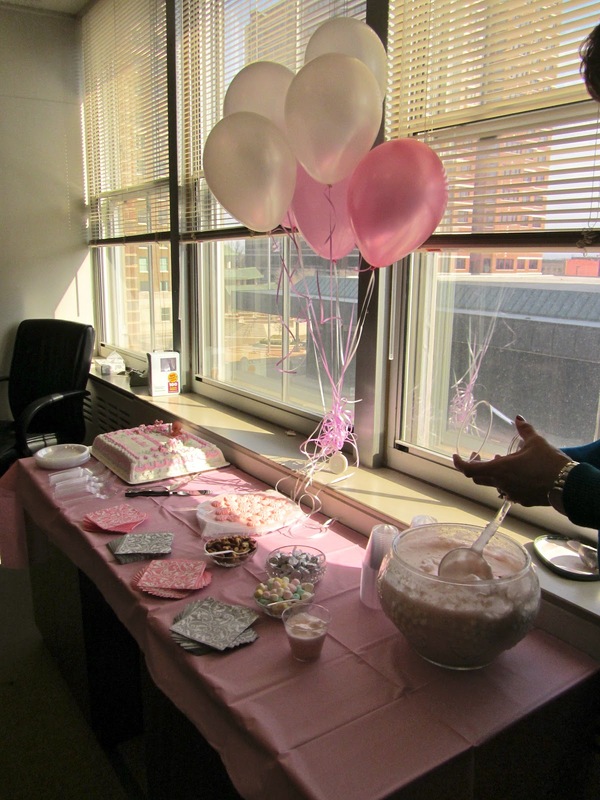 The gals in my group worked so hard to make this so special for me. I loved it! Little better shot of the table. I don't have any pictures of my opening all the adorable gifts. 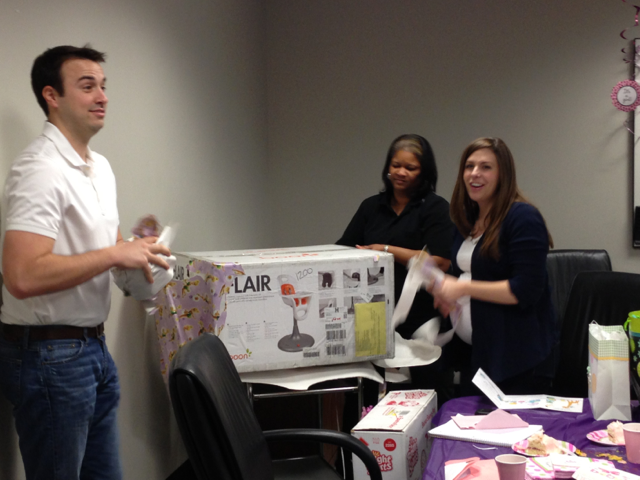 The big group gift was our baby monitor! Can't wait for Ryan to hook it up! 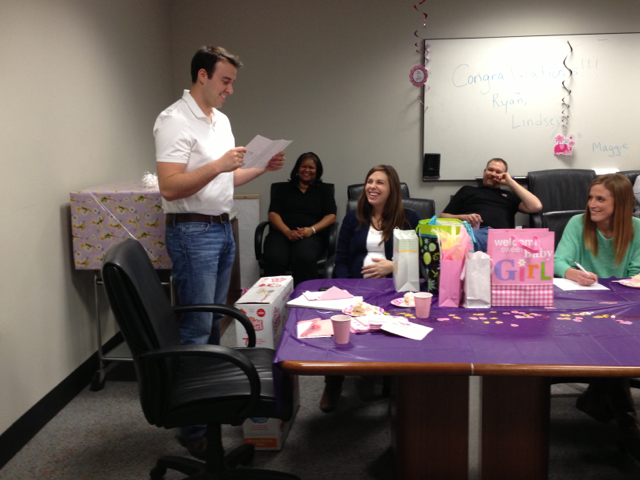 Then Ryan's group threw us a surprise shower later that same week! I can't believe how much effort everybody went to to plan this and keep it a secret from us. Can you believe someone made this for us? 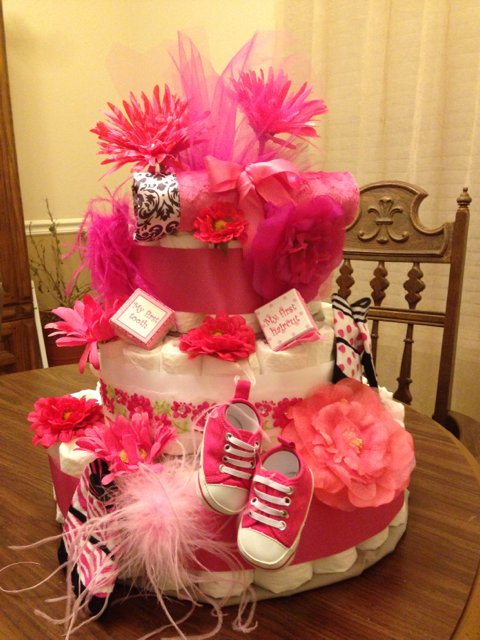 It's probably the cutest diaper cake I've ever seen!! 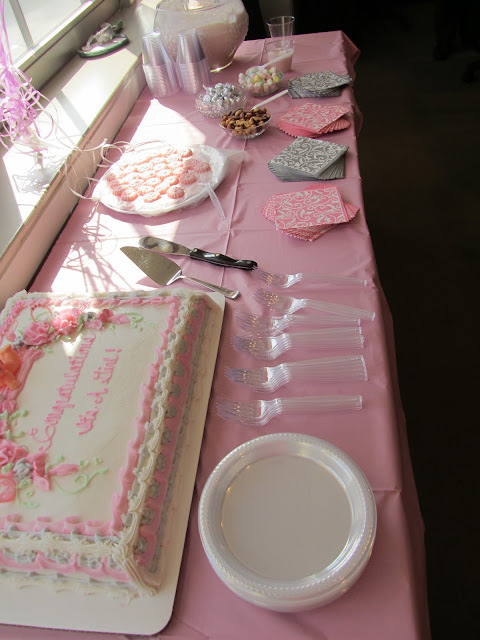 And this cake! I'm in love with it and it tasted just as good as it looks. Those pink petals are white chocolate shavings!! I didn't even have my camera since I didn't know about the shower. So I had to snag these pictures from one of Ryan's coworkers. There were so many people there but were on the outsides of the room and not in the photo shots. Opening all the sweet gifts. Opening the big group gift. 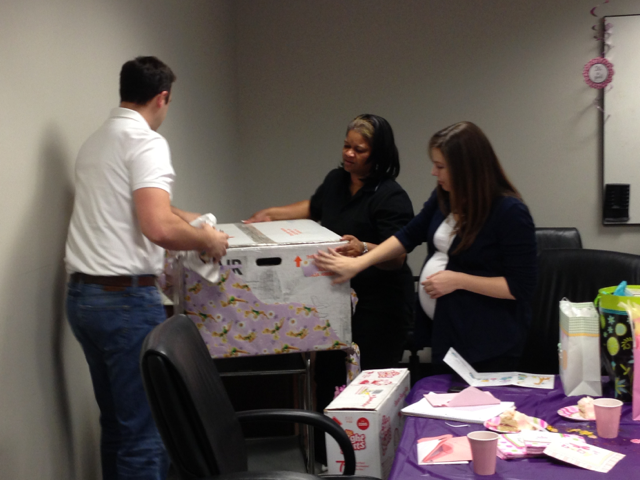 And it was our awesome highchair I was so excited about registering for!! I can't get over how many showers you've had either!! It seems like every other week you are posting about one, but that just goes to show how special you and Ryan are and how many people love you and your sweet baby girl. Any day now sweetie! She'll be here! 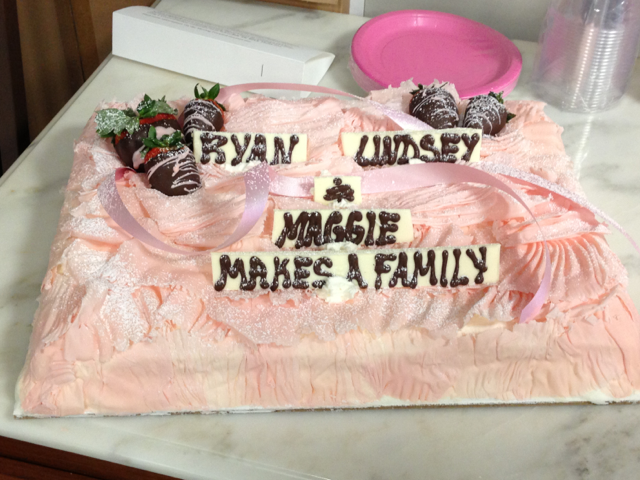 Maggie is one very loved baby!! Each time it pops up that you posted a new post I get excited thinking you are announcing that she is here :) Haha!! 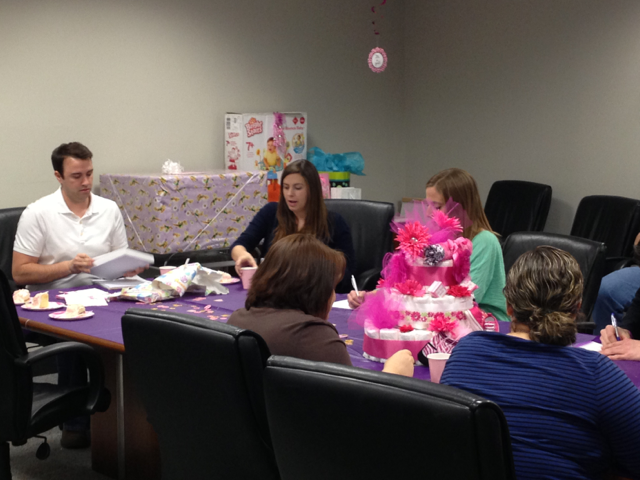 PS--that diaper cake was amazing! It's so awesome how blessed you guys are. The first is so challenging because you need EVERYTHING. And who knew babies need that much crud anyway? I'm looking forward to her arrival! What a blessing! That baby girl is so loved!